Former mineworkers talking about their experiences working in Calumet, Michigan, area mines at Coppertown Museum in Calumet's industrial core. 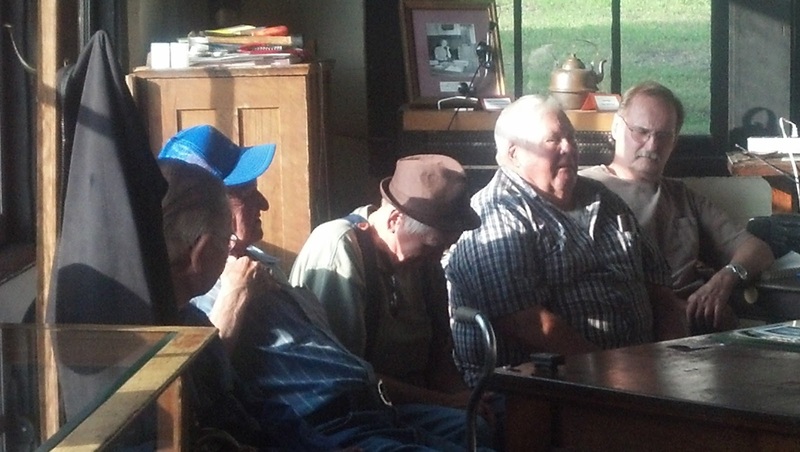 Their talk was sponsored by Calumet Main Street and is a part of Heritage Days in Calumet, photo by the author. I (Gary) had a unique opportunity last night...I was invited to give a presentation on labor history in Calumet as part of their Heritage Days activities. About 40 people showed up to the event, and things went really well. I discussed life in Calumet circa 1912 for mineworkers and how those lives, although described by a mining company official in a 1912 celebration as idyllic, was simply not the case. The best evidence for this was the bitter 9-month strike that started less than a year after the mining company official's statements in 1912. The presentation was short at about 20 minutes, but the question and answer session lasted for almost 45 minutes, and great questions they were. My favorite was: "How was the 1913-14 Michigan Copper Strike like last year's Occupy Movement?" Wow! What an incredible question and without going into huge detail my answer was, "Decentralization!," which we will be discussing in the book. But, the highlight of the night was listening to former Calumet area mineworkers discuss their experiences working in area copper mines. Topics included in the memories of these mineworkers were mine accidents, good points of working in a mine, area saloons, and colorful characters of the Copper Country. In essence, these memories were living testimonials to what conditions in the mines and the area were like...in their own voices and it was a great honor to hear these voices. 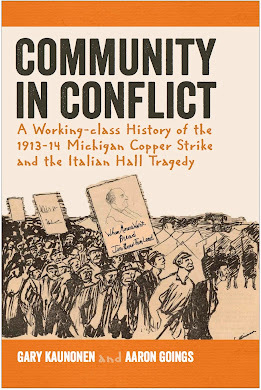 This is actually what the upcoming books is all about: giving voice to those who did not have a voice during the 1913-14 Michigan Copper Strike. We are attempting to tell a type of working class or peoples' history of the event. That is our main focus with the book and our goal in doing our research and writing. I went to give a presentation and inform on what life was like in the Copper Country circa 1912, but in the end I was given the opportunity to listen to and learn from people who incredible life experience. It was an honor to be able to listen to those folks wax nostalgic about their experiences. So, the night was a great event and there are even more events planned for the rest of the week including the four year of the Red Metal Radio show, which is staged live at the beautiful Calumet Theater. Details on that radio show and the rest of Heritage Days' events: http://www.mainstreetcalumet.